Rose pink(5 pt. ), Сhrysanthemum green(2 pt. 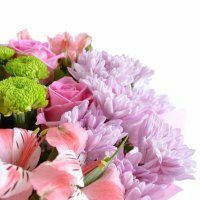 ), Сhrysanthemum pink(4 pt. ), Alstroemeria pink(4 pt. ), Rose spray pink (2 pt. ), Packing(1 pt. ), Tape(1 pt.). 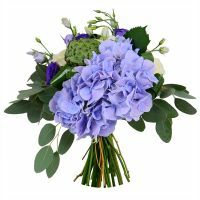 Birthday, Colleague, For her, For mother, For young lady, New-born, Wedding flowers, Аnniversary. 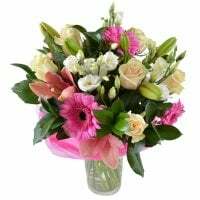 If you want to say to your beloved one “good morning”, congratulate your mother on March 8 or your sister or girlfriend on her Birthday - order this bouquet of pink flowers for them. 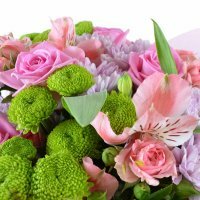 Having received such a cloud of tenderness, every woman will feel, at least, like the winner of the title Miss Charm or Mrs. Feminity. And they will be in a good mood all day long, and a happy smile will beautify their faces. 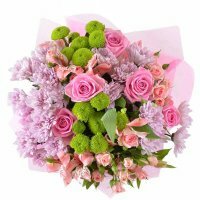 Green and pink chrysanthemums are put together in the bouquet, they are in harmony with pale peach roses. 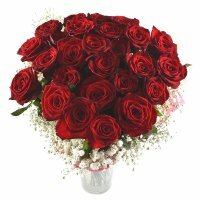 Pretty flowers for beloved ones! Manager response: Thanks for the feedback! Have a nice day! 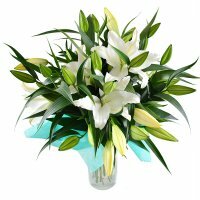 So late delivery time!how possible simple a flower delivery on 4 hours?! Manager response: Thank you for your feedback. Unfortunately, in your order was no delivery address, the delivery was agreed with the recipient. 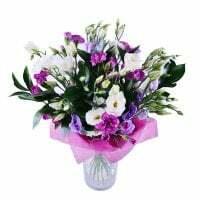 The recipient asked for delivery at the specified time. We are very sorry that you did not like the execution of the order.